#Wicked Wessex objects on tour 2018-2019 – grim and gruesome to strange and shocking! 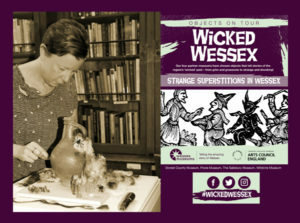 ‘Wicked Wessex’ is the theme of the latest objects tour by the Wessex Museums Partnership: Dorset County Museum, Poole Museum, The Salisbury Museum and Wiltshire Museum. Each Museum has selected an object which they believe best represents the chosen theme. Starting on Saturday 20 October, each object will be on display starting at their home museum, then after three months they will rotate around the others in turn until Oct 2019.